If a law is such that you have to look it up to see what it says; to see what it says you are allowed to do (or prohibited from doing), it's not a real law. If it is written so that you need a lawyer to interpret it for you after you look it up, to tell you if something is "legal" or not, that "law" is even worse. 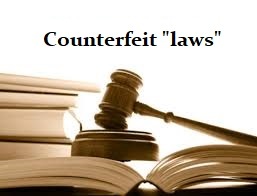 In fact, it's an even clearer sign that the "law" is counterfeit. The mere existence of lawyers is irrefutable evidence that the majority of "laws" are counterfeit. Of course, who do you think writes those counterfeit "laws" to give themselves "job security"? Quite a racket, if you can keep getting away with it. And of course, "Ignorance of the law is no excuse". Except for law enforcement.